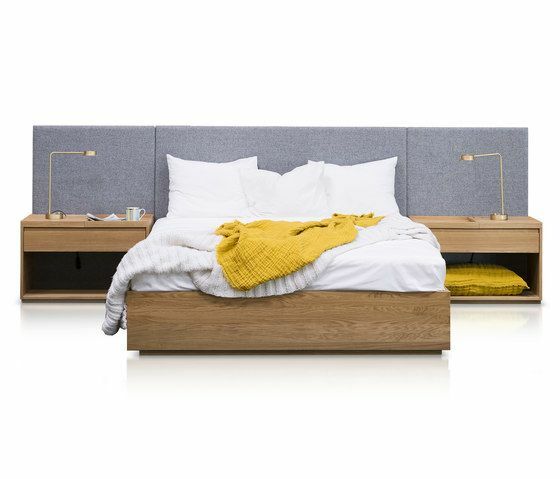 ’Ull & Eik', which directly translates to ‘Wool and Oak’, is a combined bed and cabinetry system. The base unit is compiled of four drawers which are fitted with a bed frame. The bed frame is attached to an upholstered headboard and solid oak bedside tables. Each bedside table has its own hidden outlet for charging your phone while you sleep and a small drawer for personal items. This is a 'made to order' product, so please contact us regarding pricing information and configuration possibilities. The beds are designed and made in Norway. The drawer fronts, shelves and tables are made of solid oak which can be delivered with an oiled or stained finish. The standard fabric for the headboard is a wool blend from Gudbrandstalens, a Norwegian company. Please note that the mattress is not included.